JOHANNESBURG — Dirk Nowitzki stood in front of some Kenyan journalists and tried to impress them in their native language during Basketball Without Borders last week. Let’s just say his Swahili needs some work. So why is the longtime Dallas Mavericks star speaking Swahili? The connection is Nowitzki’s wife, Jessica. She was born Jessica Olsson to a Swedish father and a Kenyan mother. Her mother is from Nanyuki, Kenya, a market town northwest of Mount Kenya that was founded by British settlers and is the home of the Kenya Air Force. The Nowitzkis had wedding ceremonies in Germany and Kenya in 2012 and have three young children now. Nowitzki has made several trips to Africa, and his family went to Kenya to visit his wife’s family before arriving in South Africa for the NBA Africa Game and Basketball Without Borders. Dirk Nowitzki (No. 41) talks with Kemba Walker (No. 15) of Team World against Team Africa in the 2017 NBA Africa Game as part of the Basketball Without Borders Africa at the Ticketpro Dome on Aug. 5 in the Gauteng province of Johannesburg. Nowitzki was a member of Team World during the second NBA Africa Game on Saturday. During a dinner for both teams earlier in the week, his wife joked that she wanted to sit with Team Africa, he said. 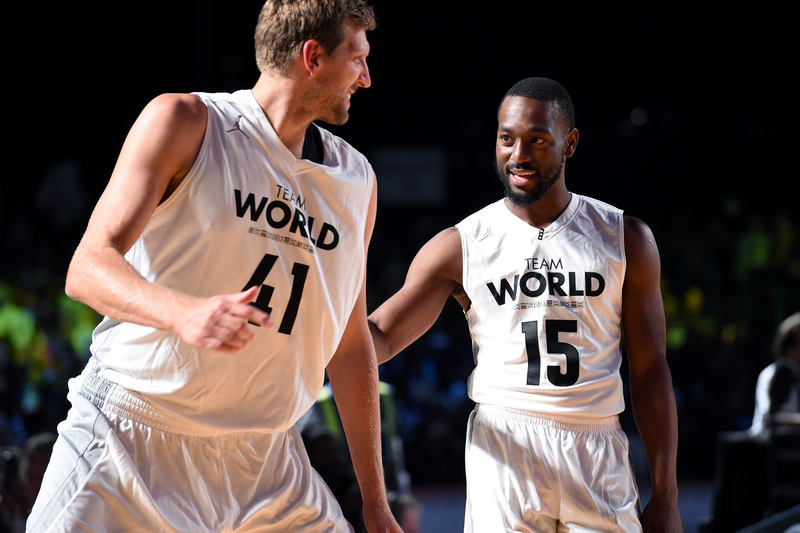 Nowitzki scored three points, on a 3-pointer, in 11 minutes as Team World beat Team Africa, 108-97. He hoped that some of his wife’s relatives in Kenya watched the exhibition. Before the NBA Africa Game, the 15th edition of Basketball Without Borders in Africa took place Aug. 1-5 at the American International School of Johannesburg. The invitation-only camp featured the top 80 boys and girls age 17 and under from 26 African countries. Nowitzki attended Basketball Without Borders in Africa for the third time. He saw a young Gorgui Dieng, now with the Minnesota Timberwolves, in a previous camp. The MVP of the 2011 NBA Finals said it was a pleasure for him to be a part of this camp, which included one kid from Kenya after three the previous year. “Basketball Without Borders is now in the 15th year, and they’ve not only done a good job with the kids but with the social outreach and the projects they have with the families and kids they help,” Nowitzki said. “It’s an amazing project. … It’s actually getting stronger and stronger. Bigger facilities. There was so much media today. When I was here [in 2009], there was nobody here. It shows it’s growing even more. During his week in Johannesburg, Nowitzki also befriended other players whom he rarely mingles with during the season, since he stays focused on the Mavericks. The 2007 NBA MVP worked out one morning on the court before the camp with New York Knicks forward Kristaps Porzingis. Nowitzki also had a long conversation with Denver Nuggets guard and Dallas native Emmanuel Mudiay during one of the camp days. He chopped it up with New Orleans Pelicans All-Star center DeMarcus Cousins on the bench during the NBA Africa Game. Nowitzki agreed to a two-year, $10 million contract with the Mavericks last month. The 13-time NBA All-Star has scored 30,260 points during his 18-year NBA career. Nowitzki averaged 14.2 points and 6.5 rebounds per game in 54 contests last season. The 7-footer turns 40 on June 19, 2018. The projected Hall of Famer is not certain whether he will play during both of his contract seasons. Once Nowitzki retires, he expects to spend more time in Kenya and possibly purchase a home there. “I signed on for two more, so hopefully I can play those two,” Nowitzki said. “Last year with the Achilles [injury], I missed almost two months. It was frustrating and disappointing. Hopefully, injurywise it will be a lot better this season and maybe I’ll play another one. We will see how it goes this [season]. We will see how the body feels. 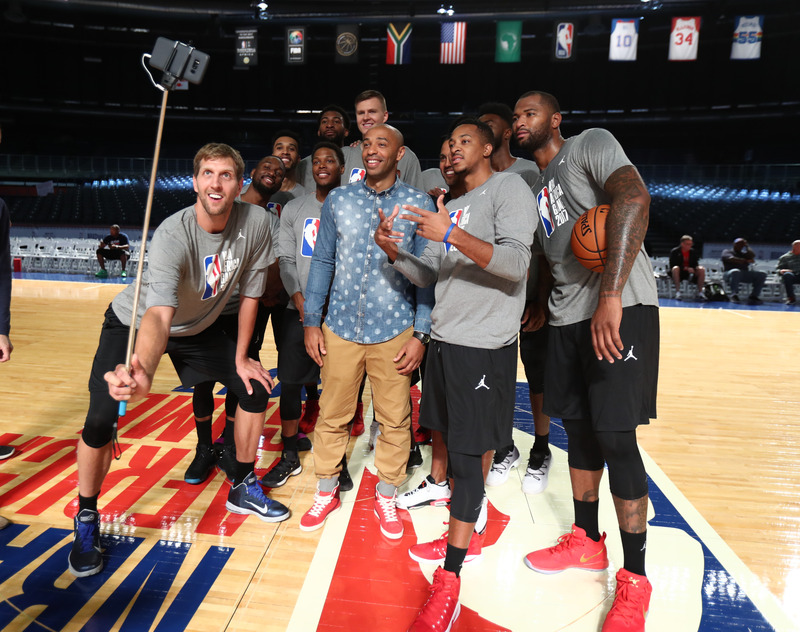 The players of Team World take a selfie for the 2017 Africa Game as part of the Basketball Without Borders Africa at the Ticketpro Dome on Aug. 4 in the Gauteng province of Johannesburg. The Mavericks also return forward Harrison Barnes and shooting guard Wes Matthews. Heralded rookie point guard Dennis Smith had a strong summer league performance. Still up in the air is the future of center Nerlens Noel, who was acquired in a trade last season from the Philadelphia 76ers. The 6-foot-11, 228-pounder averaged 8.5 points, 6.8 rebounds and 1.0 blocks in 22 games with the Mavericks last season. Noel is a restricted free agent who has yet to sign with any team. If he were to sign a contract sheet with another team, the Mavericks would have the opportunity to match. “He’s so young and so athletic. I’d love to keep him,” Nowitzki said. “I’m sure that is what the Mavs are thinking. … We obviously traded for him last year with the hope he will stay with this franchise for a long time.